The Big Dog gives a hint of Kittleson’s passions for both art and animals. He combines the two in his vivid portraits of peoples’ pets. Yes, he can sketch horses, cats, and farm animals, but his core subjects are dogs of all kinds. “I just finished my 82nd portrait in five years,” the artist says. However, there’s another Big Dog in his life. Kittleson, 37, deals every day with a rare genetic disease called “rapid-onset dystonia parkinsonism,” abbreviated RDP. It’s a movement disorder that slows his speech and affects muscles in his hands and arms, among other symptoms. For example, while he is able to use a walker, Kittleson often rides his motorized wheelchair to get around. Originally from Virginia, Kittleson completed an associate degree in graphic art there and used his graphics skills for several years as an artist for a commercial printing shop. He also worked as an estimator for a sign company. In 2006, he moved from the East Coast to the St. Ansgar, Iowa, area to help his family with a cattle farm. Three years ago, Kittleson took up his current home in Austin, Minn., where he lives with his wife, Jenny, and dogs, Roscoe and Ellie. 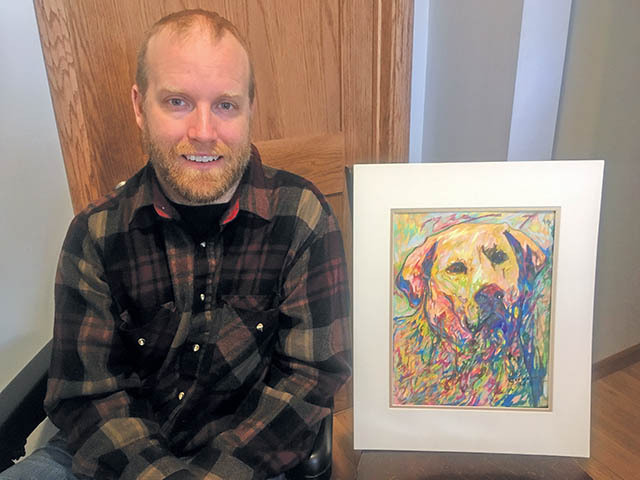 In his youth, the artist had been partially paralyzed by a school wrestling accident. Symptoms of the genetic disorder started appearing about eight or nine years ago during his Iowa years, Kittleson says. And they came rapidly, as its name suggests. Even experts at Mayo Clinic were not sure about the sudden disease. “It was a puzzle for them,” Kittleson says. Following a Mayo referral, doctors at Wake Forest Baptist Medical Center in North Carolina diagnosed the symptoms as the rare RDP condition, he says. After learning the diagnosis, “I didn’t know what was going to happen,” Kittleson says. He turned to his proven skill. He gives credit to wife Jenny for suggesting the path leading to artistic pet portraits. Kittleson’s gallery of work today shows a unique style. Portraits contain bright colors and visible strokes. Lines of different hues mix together to form images or a backdrop. His portraits share some common elements with Impressionist paintings, the artist agrees. In one way, his RDP has contributed to Kittleson’s style. “I used to do oil pastels,” which are created with thick sticks somewhat like crayons. He switched to drawing with colored pencils because of muscle changes. “For my hands, it’s easier to hold on to a pencil,” the artist says. Kittleson creates the pet portraits on commission from his customers. Clients send him photos of their dogs, and he draws from them. These are not merely reproductions. Kittleson adds his own artist’s eye to bring them to life. “I like certain types of color,” he says. The portrait itself usually is delivered as an 11×14-inch piece, suitable for framing. Kittleson supplies a mat as part of the price, which often is in the $400 range. The artist has posted galleries of his pet portraits and other works at www.jonkittleson.com. His art is a part-time pursuit. In addition, Kittleson works part-time as paraprofessional reading instructor for third and fourth grades at Neveln School in Austin. But the art means more than earning a living. “I enjoy doing it; it’s just fun,” he says. Jon Kittleson’s advice to others caught in the grip of RDP or other Parkinson’s diseases: “There’s hope. Don’t get discouraged! Bob Freund is a freelance writer based in Rochester.